Give it a try, see the results! Are you working on getting in better shape? 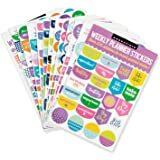 Hello New Me will be your convenient diary and motivating planner during your next three months or 90 days (the standard time span for a weight training program). Easily record your food consumption: breakfast, lunch, dinner and snacks. Monitor your daily water intake. Keep track of your daily activity and exercises. Oversee your cravings and how you respond to them. Keep an eye on whether you get enough sleep. Control how your mood reflects on your will and eating habits. Note your feelings about your progress and missteps to improve each and every day. It is a great size (7.5 x 9.25 in) to carry in your purse or bag and in the same time have enough space to jot down everything needed. Why are food diaries so effective as a weight loss tactic? Writing down and seeing your daily food intake gives a better perception of how much you actually eat. Studies show that tracking and planning your meals for a week or more yields the best results, but even recording your nutrition for one day can make a difference. 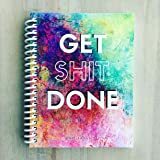 Journal notebooks help you identify both your good habits (for example choosing healthy nutritious snacks) and your bad habits (for example drinking mostly sugary drinks). 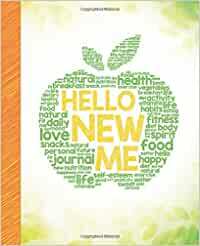 Get Hello New Me now and set yourself up for success on your way to more fitness, health and weight loss. I was looking for a food and exercise diary. I wanted something where I could write down (i.e. not an app) calculate my calories intake (food) and outtake (exercises). What I like about this book is that it does NOT focuses on weight loss. It focuses on self-esteem, body positivity, and feeling good and healthy. For instance, the page for Day 1 is titled "My Starting Point". It includes a woman figure and one can write down their measurements. This woman figure is not a stick thin / VS model. In addition, below that woman figure, there is a note "I am gorgeous the way I am! But here's what I'd like to improve...." This page is also found at the end of the book to compare with your starting point. What I also like about it: there are a few blank pages at the end, which I have used to take notes. Very useful. I absolutely love this book. It's perfect for keeping track of your meals, water intake and activity. Leaves spaces for your goals and it's a great size to just leave on the counter without being bulky. Exactly as expected and arrived right when they said it would. Really simple and detailed guide !